Writing a thank-you letter after a job interview is always a good idea. In fact, some employers think less of interviewees who fail to follow-up promptly. It's quick and easy to follow up after an interview with an email, note, or formal letter. Taking the time to do so will help you leave your interviewer with a great impression. Why are thank-you letters important? The first reason to send a thank-you letter is that it's just plain, good manners. But there's also a self-serving purpose: a thank-you note is your opportunity to get your name in front of people one last time and leave a positive impression. If you're being interviewed interviewed or going through the job application process, thank-you letters allow you to sell yourself as a candidate. You can reference specific instances that may have come up in an interview. Use your thank-you letter to highlight the ways your skills and experience are a good match for the position. Also, if there's something you forgot to mention during the interview, this is a great opportunity to bring it up. 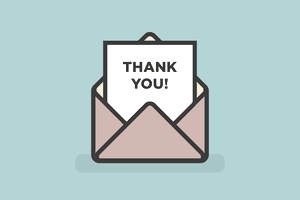 Thank-you notes in other career-related situations — such as a thank-you note to a boss for helping you out or to a former co-worker for making a networking connection — allow you to reinforce that you appreciate the person's helpful gesture. I would like to thank you, most sincerely, for taking the time to interview me today for the Social Media Specialist position that has opened with Acme Corporation. It was great to meet you and your team, and I truly enjoyed learning about your current marketing program and touring your office. I was impressed by the opportunity your next Social Media Specialist will have to build a strong, rebranded presence for Acme Corporation on Facebook, Twitter, Instagram, and LinkedIn. As we discussed, my experience includes creating and managing social media properties for both established and start-up organizations. My successes include building a network of 5K Facebook followers for J.C. Enterprises within three months, ghostwriting LinkedIn posts for the CEO of Union Industries that attracted, on average, over 350 “shares” each, and helping the owner of Jenny’s Bling to become a major influencer in her industry. If I can provide any additional information to help you with your decision-making process, please let me know. I look forward to hearing from you soon! Browse this list of thank you letters and email messages for guidance and inspiration in crafting your own letter. Send thank-you letters as soon as possible. Did someone do something helpful? Did you have an interview? Write your note that day or on the next one. It's easiest to write a thank-you letter when the details of an encounter are fresh in your head. Whether you're writing a thank-you note after a phone screen or sending a quick note of appreciation to your boss, it's best to write — and send — your note promptly. A good guideline is to send the letter within 24 hours. Delaying serves no helpful purpose and increases the likelihood that you will forget to write the note. Also, delay too long, and the company may make a decision before you have the chance to make one last positive impression. How to write a thank-you letter, including who to thank, what to write, and when to write an employment-related thank-you letter. More thank-you letter tips, including how to handle group interview letters, timing, proofing, and more employment thank-you letter writing advice.